The Facebook stock split date will be a major event, but it's received very little coverage from the mainstream media. We've been updating Money Morning followers regularly on Facebook Inc. (Nasdaq: FB) stock split news because we know FB shareholders have a lot of questions. And we've decided to compile the most common questions into a handy FB stock split guide. Facebook CEO Mark Zuckerberg said in a Dec. 1 Facebook post he will be donating 99% of his FB shares (valued at roughly $45 billion at the time) to the Chan Zuckerberg Initiative (CZI) over time. CZI can provide political donations, spend money on lobbying, and support philanthropy efforts across the world. The problem with donating 99% of his shares is Zuckerberg would lose his majority vote. That means an activist investor could buy a large stake in the company, then place pressure on Facebook to operate differently than it has been. And because Zuckerberg's leadership has helped the FB stock price climb 221% since its 2012 IPO, Zuckerberg changing his long-term plans for short-term profits would not be good for FB shareholders. In order to maintain control of the company while he donates his stock, Zuckerberg announced a Facebook stock split proposal in Facebook's Q1 earnings call. On June 20, shareholders placed a vote for the 3-for-1 Facebook stock split. Because Zuckerberg controlled nearly 60% of the vote, it was just a formality. The vote easily passed. In the Q3 earnings call on Nov. 2, Zuckerberg did not talk about the stock split. He also did not receive any questions about the stock split. But when the stock split does occur, what exactly happens? What Will Happen on the Facebook Stock Split Date? Facebook Class A shareholders have one vote for every share of FB stock they own, and Class B shareholders have 10 votes for every share they own. On the Facebook stock split date, shareholders will receive three shares of a newly created Class C share. But unlike the Class A and Class B Facebook shares, Class C shares do not have any voting power. Some shareholders will not like that. Keep in mind, Zuckerberg controlled nearly 60% of the voting power to begin with. Essentially, Zuckerberg always had the final say. That means nothing will really change in terms of voting power. On the day of the FB stock split, it may look like the value of your FB stock has been cut by a third. But the value of FB stock will remain the same. It's just the price of Facebook stock that will change. On April 8, Under Armour Inc. (NYSE: UA) stock underwent a 2-for-1 stock split. If UA shareholders were unaware of the split, they were in for quite the surprise that morning. It would have appeared that the stock lost half its value in one day. But the stock had the same value because shareholders now had two shares of UA stock instead of one. The shares priced at $45.27 were really worth $90.54. 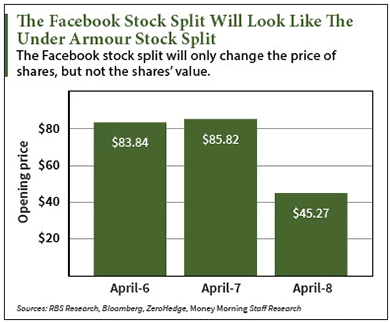 The FB stock split will look like the UA stock split, except FB shareholders will receive three shares of the newly created Class C shares for every one share they own. The Facebook stock price opened today at $122 per share. If the 3-for-1 split happened today, shareholders would receive three shares, trading at $40.66 per share. It's the same exact value, just a different price. Alphabet Inc. (Nasdaq: GOOGL, GOOG) had a dilemma similar to Facebook in 2012. Google co-founders Sergey Brin and Larry Page weren't donating stock, but they wanted to protect Google from outside investors taking a large stake in the firm and influencing their decisions. So they had a stock split similar to what Facebook plans. They sent a letter to shareholders in 2012, saying they wanted to shield the tech giant from activist investors who thought they knew what was best for the company. Page didn't want Google to stop long-term projects and innovative research just because some projects were currently unprofitable. In order to keep the majority vote and do what the co-founders thought was most beneficial for Google in the long run, Brin and Page proposed a 2-for-1 stock split on April 2, 2012. Google was sued by a pension fund, claiming the split was unethical. The lawsuit said the stock split would insulate Brin and Page from the voices of retail investors. The lawsuit wasn't settled until June 2013, which delayed the Google stock split until April 3, 2014. That was almost exactly two years from when the split was first proposed. And just like Google, Facebook now has its own lawsuit to settle before its stock can split. On April 30, a shareholder filed a class-action lawsuit against the social media giant. The lawsuit claims FB shareholders aren't benefited in any way by the split. The lawsuit contends Zuckerberg retains control of the company even when he sells his shares. Before the Facebook stock split date, Facebook needs to settle this lawsuit. That means the Facebook stock split date may be pushed back to 2018. We will continue to update this guide as more Facebook stock split news is released. In the meantime, we wanted to make sure our readers knew about the bold Facebook stock price prediction from Money Morning Director of Tech & Venture Capital Research Michael A. Robinson. The Bottom Line: The Facebook stock split date has not been set, but it will happen. Shareholders will receive three shares of a new Class C share for every one share they currently own. On the day of the stock split, it will look like the share price has lost a third of its value. But only the price will change, and not the value. Stocks splits have nothing to do with voting power. They are good for small shareholders because they can hedge with options. Splits also help liquidity and are in general good for the stock price. What normal person can handle 100 shares of AMZN, plus a 100 shares of GOOGL whilst keeping a reasonable diversification? These stocks are for the Hampton crowd.